Catching a smaller-scale museum exhibition is a perfect thing to do if you want to soak up a quick dose of culture and don’t want to get overwhelmed by the whole museum thing (too much art in too short a time can be over-stimulating for some of us). One of the many benefits of being a museum member is being able to pop in and out when the urge strikes. Biking home from a business lunch yesterday (Sonsie on Newbury), I stopped on a whim into the Museum of Fine Arts to check out the “Fresh Ink” exhibition, which is running until Feb. 13 in the Gund Gallery (downstairs in the new wing). Fresh Ink features 10 contemporary Chinese artists, each of whom selected a piece from the Museum’s permanent cache of classical Chinese art as inspiration for their new works. The gallery features both the ancient and the new side-by-side “in dialogue…the ancient will historicize the contemporary, while the contemporary will revitalize the ancient” as the MFA puts it. I felt strangely teary as I stood in front of Yu Hong’s Spring Romance, with the original piece displayed in front of it from the early 1100s of women making silk. The portraits of everyday young Chinese women, painted in acrylic on giant luxurious golden silk panels made for an odd juxtaposition…the noble Chinese ladies’ lives portrayed on the old scroll seem so much simpler and defined compared to women’s roles today, when we are expected to “be” many things, playing our many roles to perfection—and looking perfectly beautiful while we’re at it. 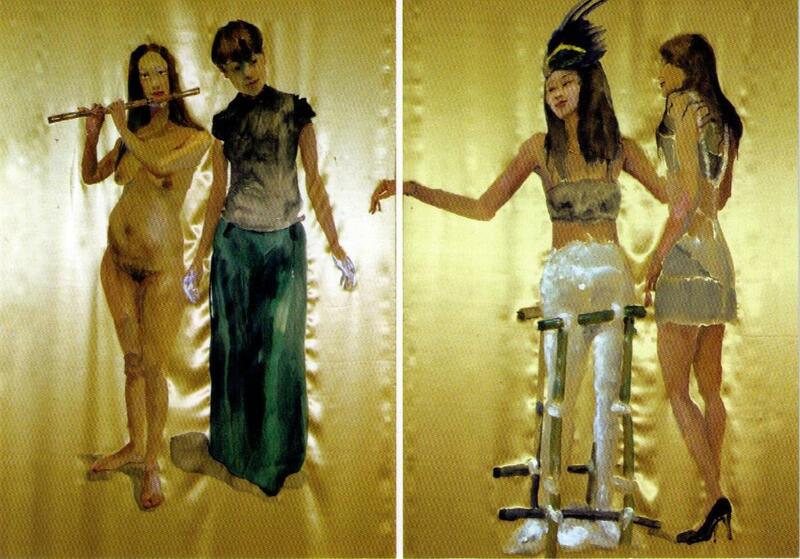 The women on Yu Hong’s panels are vulnerable yet strong, intelligent and beautiful: the woman standing in the odd plaster and bamboo cast-contraption, who broke her legs after jumping off a building in despair now looks somewhat defiant and even bemused by her situation, looking affectionately at her friend on the next panel, the artist Yu Hong, identifiable by her plaster-covered hands. I love what you wrote here. I saw that show and somehow missed the info on the woman in the cast and how she broke her legs. Your writing is fresh and personal ! Thanks, Karen! I wish this exhibit was still around, because there was so much to absorb and think about. Yu Hong’s art really resonated with me, but there was another artist who did a mural of a group of Boston Public High School kids that was really amazing too–I wish I could remember his name but I can’t at the moment!